This quote really resonates with me. It represents a dramatic shift in perspective that we all could benefit from adopting. In particular, this quote really addresses the idea that not all “dark” or negative places in life mean that things in your life are falling apart, that you are stuck, or there is no place to go. This quote literally suggests that dark times could be amazing opportunities to grow, make changes, or start anew. 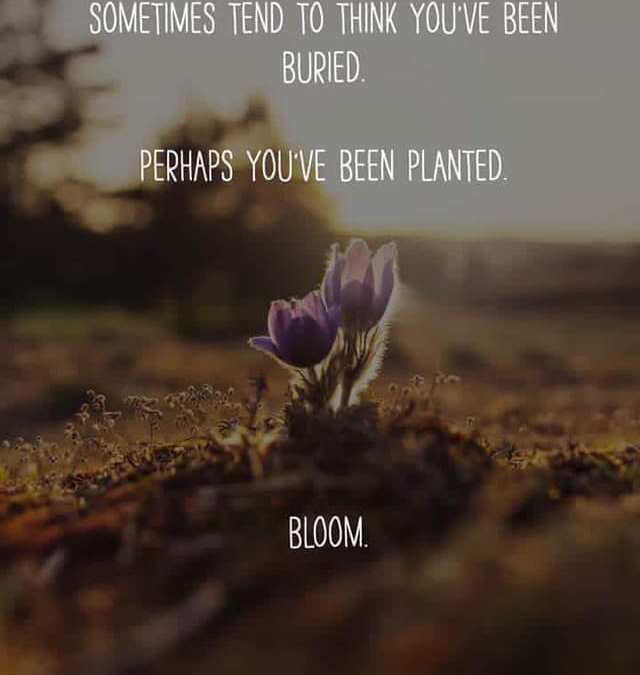 This quote is a wonderful message of positivity and perspective shift, as it challenges your mind to consider that things are not always as they seem, that there is a silver lining, and you really are not stuck. Not only does the message contained in this exact quote possess a ton of power, but the underlying idea that we can change our perspective to change outcomes in our life is perhaps even greater. The truth is that there are many ways to “see” a situation. Take studies that have examined bystander reports of how a traffic accident occurred. These studies have shown that depending on the person interviewed, their angle in observing the accident, and additional information they may have been exposed to, their perspective and memory of the event are chock full of errors and biases though they each observed the same incident. This, too, occurs with nearly anything in life. Two people can be exposed to the same situation and only one walks away feeling disturbed by the event whereas the other is not affected and goes on without even giving the situation a second thought. What we are describing here is perspective. We all have different perspectives based on our past experiences, beliefs, values, morals, distress tolerance, psychological flexibility, etc. How we approach a new situation or recall a past situation is very much influenced by these and other factors. The power in perspective is that if we choose to do so, we can learn how to identify other ways of looking at a situation. This requires open-mindedness, curiosity, and the willingness to think differently, but is a very effective tool to dig one’s self out of a negative state and turn a perceived negative situation into a positive one (or simply an opportunity for growth and change). On the other hand, a person can just as easily choose to stay “stuck” in their current thinking and not making any changes in their life. And yes, this is a choice. In every situation, there is a different way of looking at things, but a person must be willing to consider alternatives in order to look at a situation differently. Sometimes the most important and difficult shift in perspective a person can make is simply being willing to look at things differently. However, the benefits of this most fundamental perspective shift will yield significantly positive outcomes in your life when you are able to look at situations from a different approach. At Tampa Therapy, we are committed to providing a relaxing, healing, and non-judgmental environment to support you on your journey to mental and emotional growth. If you want things to be different, you have to change them and you have to first be willing to change them. If you are even willing to give change consideration, we are here to help you with the rest. Give us a call or email us today to start the process of making important changes in your life.